Coaching Skills and Competencies Applications: Improved Team Collaboration, Team Spirit, and Staff Retention. There was a company Supervisor (in quite a large utility company). She was experiencing communication problems with her team. There were 12 team members in total, 9 of which were tenured and 3 of them were new to the company. The tenured staff members did not want to welcome new team members. It was a "them and us" attitude. When the new team members were proposing innovative ideas and plans, they were shot down and told, "we don't do that here." There was a very tangible conflict and awkwardness in the team meetings and the team members ended up working individually (even when they were expected to be communicating together on team projects). The team were not listening to each other and were missing out on opportunities to collaborate in order to create better results. Unable to resolve this issue, the Supervisor was professionally coached by an ICF certified coach for 6 months. The Supervisor explained the situation and discovered new Solution-Focused ways to resolve the situation. Several sessions went by and the Supervisor told the coach that she had actually felt heard for the very first time. One of the action tasks that the Supervisor set herself and completed was to share her story with her team in a team meeting. She entitled it - "The Power of Being Heard". She then started asking open-ended questions when interacting with her team (to model what she expected). She held a team meeting where the team brainstormed together how they would communicate more effectively. The team utilised a team charter to pen their action suggestions and unanimously agreed to hold each other accountable for their action items and deadlines. The staff team then started taking turns leading the team meetings. Small groups were created to make sure that all team members were involved and participated in projects. One year later, the team was assessed and the results clearly showed that team collaboration, team morale and staff retention had improved in comparison to a prior year's data. Team members had shared feedback saying that they had felt they were more valued and felt they were now delivering more of their potential. A Manager was having communication issues with her staff. What she did not know was that she was following the example of how her Director related to her when allocating tasks (always telling instead of asking). Therefore, her team were not listening to each other and were missing out on opportunities to collaborate together. This Manager worked with an Erickson Coach who aided her to explore the option of asking open-ended questions when speaking to her team. The Manager enjoyed the power of being heard which she then went on to practice with her team. The Manager and the staff team all collectively felt valued. The team found it easier to collaborate which in turn created more innovative ideas. Team spirit and staff retention improved on this team. 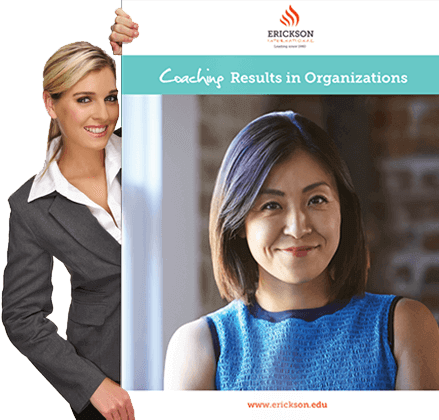 Erickson’s latest leadership coaching skills program that meets a demand from our clients who want to strengthen and develop leadership skills in their organisation via Solution-Focused teamwork and coaching. This course develops coaching skills and competence as a leadership strategy, resulting in confident and effective leadership.